I mentioned a few weeks back that I was entering a competition called Embellished Idol. Well we are up to Round 3 and I am still in it. I would love to continue on in the competition but I need your help. I would love if you would vote for me. First of all, you'll need to register at the Embellished Forum then you can vote. You click on the Round Three button and it will show the list of participants. Choose your top 5 - feel free to vote for me LOL and my friends Jodi (batnbub) and Danni as well. If you want to get a look at the participants entries, head to the Embellished Idol Blog. Down the left hand side you will see a folder called Round 3 - there are pictures of all the projects for Round 3. Our task this week was to scrap a life motto, but we were not allowed to scrap on cardstock. I went with a canvas and was pretty happy with how it turned out. The following two LOs are my pieces for Rounds 1 and 2. As for the rest of the life, all is well. Joel is still tottering around. He doesn't actively walk yet - he won't initiate the walking but if we stand him up, he'll walk to us or to the couch. Still very cute! Andrew is well and truly back into the swing of school and already looking forward to the next lot of holidays!! Work for me is going well as well. Today marks the 1 year anniversary of my Nanna's passing and it still seems quite surreal that she is not here. I miss her so very much and often think of how she would react to things or what she would say in certain situations. She would have loved watching Joel grow up. To make sure we remembered Nanna, my sisters and I got together for lunch. It was nice to catch up and remember Nanna. We were actually talking about the photo above, saying that is was so her. She was making her yummy pasties and she still had she still managed to be wearing her pearls. I really need to finish up. Till next time, don't forget to vote for me!! This happened at our house tonight. We are all very excited!!! 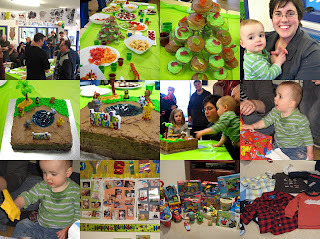 So after I posted my last blog post with all the pics of Joel's party, Andrew was looking through and was a little disheartened that there wasn't a pic of him and Joel in there (I'm sure I put on in the collage but it's not there now). So for Andrew's sake here is a pic of Joel and his Daddy (not a super great photo but a photo all the same!) And also a few extra photos that my friend Marina had on her computer. Thinking hard about what to play with next!! 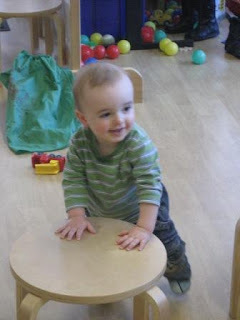 Joel's fave thing to do - push stools and chairs around! As for the nurse visit, Joel is growing along nicely. Still a littley but that's ok with me! He now weight 8.5kg and is a whole 6cm longer than he was in March!!! He's now 74cm long. The nurse said he is doing brilliantly and that's all I wanted to hear so we are happy. That's all for now. I'm off to eat another cupcake!!!! So we survived the first birthday party. We are all so tired and full but happy. It was a great day. Lots of people, laughs, food, presents (lots of those!!!!). Poor little Joel woke up with the killer of all blocked noses and a very husky little voice (AGAIN!!!!) but he was a trooper and the party went on. He was a little clingy for most of it but loved the present opening time. He was totally totally spoilt. 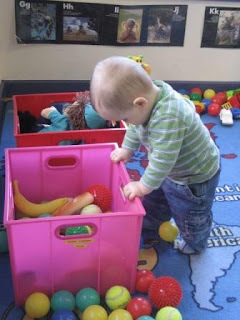 So much stuff - we seriously look like we have robbed a toy shop. You can see his mother load of presents in one of the last photos. CRAZY CRAZY. Just wanted to share some pics of Joel's special day with you all. A photo of Joel's present from my Mum and Dad - a Thomas the Tank engine babushka - all the way from Russia. Cute, hey!! Will be back in the next couple of days for a party wrap up and I think it may be time for a header change as well. This time last year I was laying in a hospital bed, holding my newborn son and feeling a little sore but so very proud of myself. Yes that is right - Joel is 1 today. Can you believe? I really can't. This year has seemed to fly by and I know I sound old saying that, but it's so true. I've been going back to July 2nd 2007 all day today, remembering what happened, how it all unfolded and the awesomeness (is that a word??) of the day - forgetting all the pain and yucky stuff of course. It still seems so fresh in my mind. But a lot has happened since then, and my little Joel is growing up. He makes me laugh at least once a day (and often makes me cry too! LOL). He amazes me the way he is constantly changing and learning and I cannot wait for the next year to unfold and see what he has in store for us. 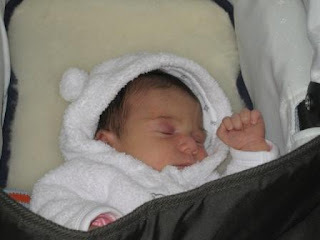 I am loving the journey of motherhood, and could not have asked for a more perfect first child. Joel joel, I love you sweetpea and I'm so excited to continue to see you grow into an awesome little boy. Big smooshy kisses and snuggles. 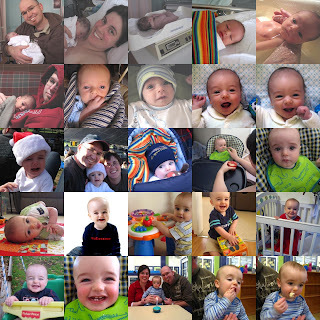 I was going to share a few pics of his first year, but being a typical first time mum, there were too many to choose from so I did a little collage up in Picasa. Hope you get the gist. 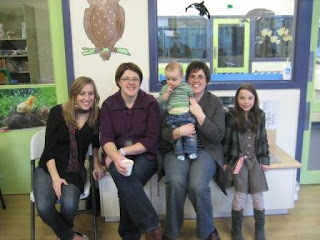 The last few were taken at our Mothers Group birthday party last week - Joel really really loved his first cupcake! We are having a party on Sunday so I will be back hopefully on Monday, to share photos and a rundown of the shindig! Thankyou all for sharing this journey with us.